Can I bring alcohol into The Resort? May I have a campfire? Campfires, fire pits, fire cages or any other open flame device are not permitted anywhere on the festival site. In other words, no. May I use a stove or BBQ to cook? The use of any outdoor cooking appliances is not permitted anywhere on the festival site. RVs may use their factory installed interior cooking appliance. What if I want to have my RV delivered? Meet at a remote location and pick up your RV. Bring it to the site and park it yourself. If you need help parking/placing your RV and you are bringing your own vehicle: First, buy a Camping Companion Parking pass for your additional car/vehicle. Meet the delivery person at a remote location and ride together in the RV to the site, temporarily leaving your car at the alternate meeting location. Once the RV is placed, ride back to your meeting spot in the delivery person’s tow-vehicle, pick up your car, and come back to the site to park your car in the companion lot. If you need help parking/placing your RV and you are bringing your own vehicle, plus you are renting/borrowing a motorized RV: First, make sure to purchase a Camping Companion Parking pass for your vehicle. Meet at a remote location and ride in the RV with the delivery person to the site and have a friend drive your vehicle to the companion lot. Once the RV is delivered, walk back to the companion lot to meet to meet your friend and give them a ride back to wherever they are parked. The delivery person can also walk back to the companion lot where they can be picked up by an associate. If you need help parking/placing your RV and you are not bringing your own vehicle, take a taxi or car service to meet the delivery person at a remote location and ride together in the RV to the site. Have the delivery person walk to the companion lot where they can be picked up by an associate. OWNER – Proof of Registration, valid I.D, RV Resort Wristband and Festival Wristband. RENTER – Rental Company Service Agreement. Renter on agreement must be present with Valid ID, RV Resort Wristband and Festival Wristband. BORROWER- Permission letter from the registered owner. Copy of registered owner’s registration and valid ID. RV spot purchaser must be named on permission slip and be present at onsite check-in with valid ID, Resort Wristband and Festival Wristband. Sorry, no. There will only be Car Camping (where tents will be allowed next to your vehicles) and RV Camping (no tents allowed). Where do all the people I am fitting into my Resort spot park for the weekend? You must buy them a Camping Companion Parking pass or they must ride in your RV or car to the festival. Those are your only options. Will there be free bathrooms/showers? Handicap accessible? Private? Yes, there will free bathrooms and showers available in separate male and female trailers (with individual privacy). Full private handicap facilities also available for patrons wearing ADA Wristbands. Are there showers? What hours can you use the showers? Yes we have free showers for Resort Campers! Thu 12pm-7pm + (1) 24 hour shower. Fri-Sun 7am- 7pm + (1) 24 hour shower. Will there be food booths or a general store in The Resort? Yes, there will be a General Store selling various sundry items that may include: Advil, air mattresses, aloe gel, Anacin, band-aids, batteries (AA, AAA, C, D), Benadryl, bug spray, chapstick, cigarettes, Stagecoach festival merch (sweaters, tanks), condoms, disposable cameras, ear plugs, eye drops, ice bags, lighters, lotion, tent stakes, mini/small flashlights, mini deodorant, mini hand sanitizer, mini soap bars, Motrin IB, mouthwash, Neosporin, Pepto, Rolaids, sunscreen, tampons, rope, tissue packets, toothpaste/toothbrush combo pack, water, Tylenol, wet-one wipes, tents, tent stakes, etc. Yes, there will be a food court selling various food items that may include: kabobs, salads, breakfast items, pizza, coffee drinks and smoothies, breakfast pastries, selection of burgers (meat, turkey, ahi, vegetarian), hot dogs, fries, sausages, pies, cheesesteaks, ice cream, shakes, fresh lemonade and a Mexican menu. Will there be a place to buy coffee or get hot water? There will be a coffee vendor in the food area. Will there be electrical outlets? There will be charging stations. Can I bring the family to camp? All campers must be 18+ or accompanied by a parent or legal guardian*. Every camper must have a Festival Wristband and a Resort Wristband to be scanned upon entrance to the festival perimeter. Kids 10 & under are free with parent and do not require a wristband. A legal guardian is NOT a parent giving a note to an older friend or sibling. That is NOT an option. A guardianship is a legal relationship created when a person or institution is assigned by the court to take care of minor children. Are generators allowed into The Resort? The Indio Fire Department has banned the use of all portable generators for the safety of all Resort attendees. Only generators that have been factory installed on your RV are permitted. No modification. No personal fabrications. No aftermarket installs. No generators in car camping. Additionally, even with a factory installed generator you may be asked to shut it down due to the exhaust fumes affecting your neighbor. 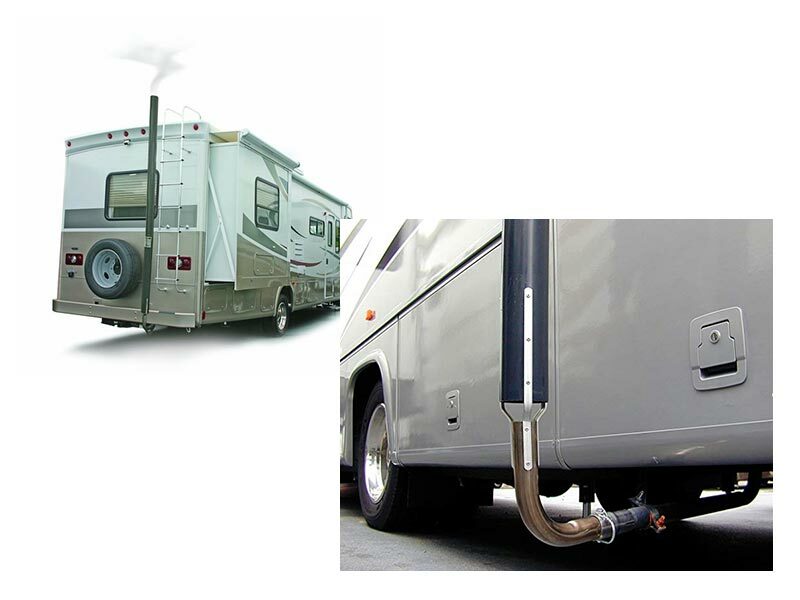 To avoid this, consider purchasing an RV generator exhaust diverter. Where is the nearest gas station and/or off-site food place? There is a gas station about 3.6 miles away, Monroe St. & Hwy 111. There is a drug store even closer, at Monroe St. & Ave. 48. There are several food places up and down Hwy 111. Are there water trucks available to fill up my RV water tank and/or pool? It is strongly recommended to have your fresh water RV tank full and your black and grey tanks empty before arriving at Stagecoach. Potable water trucks will be roaming up and down the RV lanes with fresh water as well as pump trucks to assist with disposing of RV sewage. These pay services are NOT guaranteed and are available on a first come, first served basis. Flag one down if you need it. Can I bring a guitar or other musical instrument? Acoustic instruments only will be allowed into camping. Please be courteous of your neighbors and abide by the noise curfew. If security asks you to quiet down, please do so. Some of the information here may be updated as the festival approaches or as situations change. It is advisable to check for updates before you head out. Some things do change at the last minute and we are unable to update this space. Yes! Check the Parking Map posted a few days before the festival for exact location of the bike racks. Park at your own risk. Do not lock your bike against any fencing or unauthorized objects. It will be removed and considered surrendered. 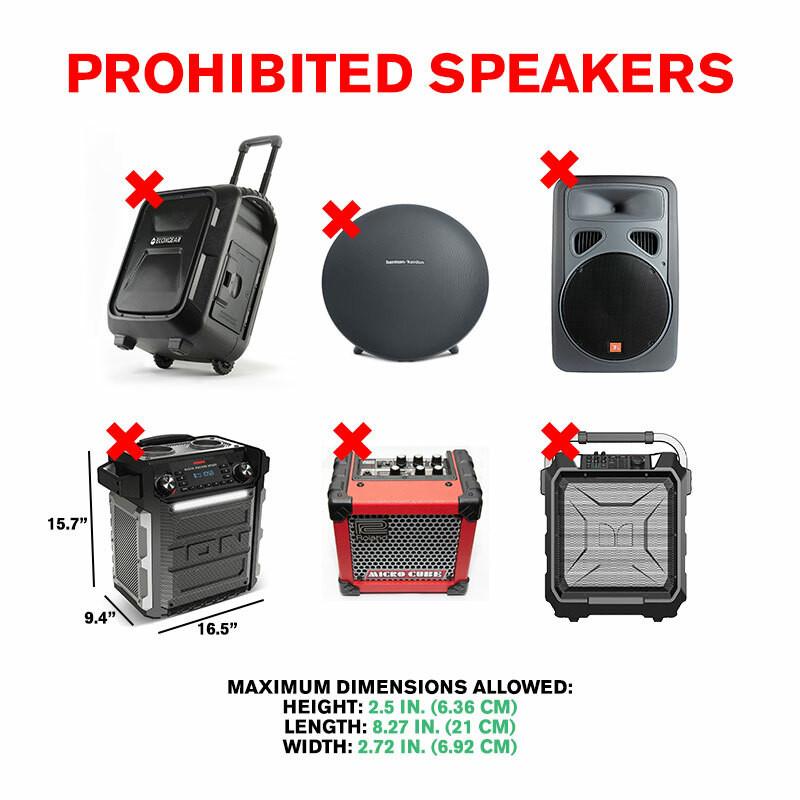 What are some examples of powered speakers NOT allowed?